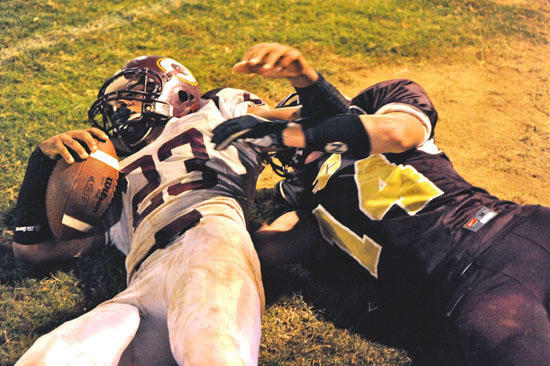 Cannon County's Brandon James, right, takes down a Grace Baptist runner in football action last Friday. Sports rivalries add an intense formula to games that seem to fuel that one particular contest more than others. One such contest will unfold when Cannon County travels to Smithville to face hated rival DeKalb County on the gridiron Friday at 7 p.m. These two rivals have been going at it in all sports for decades and all of them carry significance weight. This rivalry has grown not ony because of simple geographic proximity - Smithville and Woodbury are separated by 25 miles - but also because of genuine hatred. "There's not a whole lot about DeKalb County that I like," junior Ryan McLaurine said. "All through my life I have played them in baseball, basketball and, now, football. I respect their football team because they have a good team, but I don't like them. We have never liked them." Adding to the flavor of this rivalry, the Cannon County game at DeKalb is the first district/region game of the season for both. One of the two teams will take a step forward in the league race and the other will be playing catch up from the outset. A win would go a long way for two teams looking to reverse last year's fortunes. DeKalb County was picked fourth in the District 8-AA preseason poll and DeKalb, which was 3-7 a year ago, was picked third in the preseason rankings. "Every game is just as important as the next but sometimes rivalries have just a little more flavor," Cannon County Head Coach Joel Schrenk said. "You think about Ohio State-Michigan, Auburn-Alabama, USC-UCLA, and all of those are important but they are all the same because it is really one more game on the schedule." But this particular rivalry involved potential playoff implications, relatives pitted against one another and bragging rights. "This is our first region game and it's a rivalry game," Schrenk said. "A lot of factors are riding on this game that makes it an important game. This rivalry is deep seeded and not just superficial. It's been this way for 40-plus years." Like Cannon County, DeKalb does not have a great deal of upperclassmen, but the Tigers do have several starters remaining. One of the most dangerous players on the roster is junior receiver Sonni Young. He was named the Upper Cumberland's Receiver of the Year in 2010. "They have some good players and so do we," Cannon County junior Justin Tobin said. "It's a big rivalry and it's a big game. We don't like them and they don't like us and that's just the way it is. The game always has a different feel because of the crowd and everything surrounding it."